Superman? He's a pansy compared to Death of the Endless. It's rare in comics that a character gets to see their death coming; while it's often very dramatic, it's usually something of a surprise. Lex Luthor is one of the lucky few - although lucky may not be this right word - as he gets to stare his death right in the face this fall, and even have a conversation with it. 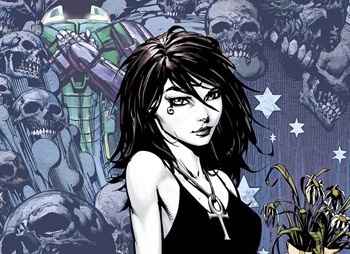 The October issue of DC's Action Comics will pit Lex Luthor against the much loved Death of the Endless, the friendly and perky embodiment of mortality from Neil Gaiman's Sandman series. Writer Paul Cornell said that he always wanted to take Luthor in new directions, and that the idea of him meeting Death first came to him while he was thinking up supernatural opponents for the character. "I initially thought, 'Oh, there's the Black Racer for Kirby's Fourth World books! The guy on the skis - that's the personification of Death there. "'I had happily been thinking of pitching that, and then suddenly it occurred to me that there's another Death, isn't there, that's from even further across the reach of the DC Universes," he said. "I pitched it to Wil [Moss] and Matt [Idelson], and they said, 'Really? What?!?' and it took them a couple of days to wrap their heads around it and see if it was possible. Then I set up to talk to Neil and had a word with Neil, not expecting him to say yes, but he said yes!" Despite Action Comics being a more traditional style comic, Cornell says that he plans to keep the issue very much in line with the Vertigo books, and not make Death into some superhero opponent for Lex to fight: "I'm obviously going to be really careful. Neil will have a look at the script. I'm not sure if he's asked to look at the script, I'd just like him to. It's going to be very much in a Vertigo mold," he said. "It's going to be Death doing what Death always does, and it's a very intense book-long conversation/debate between Death and this delicious, huge DCU supervillain in the form of Lex Luthor." As well as working on several comic projects, Cornell has written a number of Doctor Who novels, as well as three episodes of the TV show. Action Comics #894 will go on sale in October.